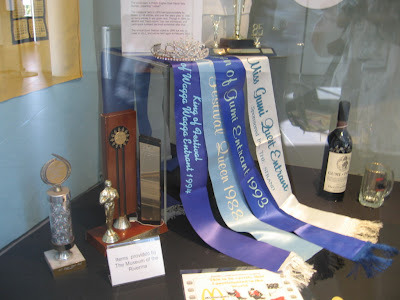 The 2012 Gumi race is almost upon us and the Wagga Wagga City Library has put together a great little display of photographs and memorabilia from the library's collection, and artifacts kindly on loan from the Museum of the Riverina. We have also heard from some people who have kindly shared their memories of Gumi . "My memories of the Gumi race are fairly scratchy as I was involved back about 1970 -1974.The Scout troop in Coolamon entered a team back then.I believe that the race started on the eastern side of Eunomy Bridge and we made our way to either the reserve just past Hamden Bridge or to the Wagga Beach. I am unsure of which.I do remember that life jackets were not used, as a lot of todays' safety requirements were definitely in use. Having said that, flour and water bombs were a necessity. We used to be bombed by watchers as we passed under the bridge as well. If the weather was hot, a dip in the river soon fixed that.From memory, the Gumis got better and faster as the years progressed as most of us started with just inner tubes and wood, there were those who were more progressive and soon paddle wheels(powered by paddle and the like were added."